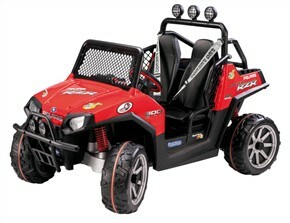 With the Peg Perego Red Polaris Ranger RZR Ride On, your little one can begin their ATV adventure! This battery operated car will get them off the computer and out of the house. Perfect for your child that's 5 to 10 years old. Watch them kick it into gear at the park or the backyard. This battery powered car includes large traction wheels with Red Line traction bands that ride on almost any terrain. Your little beginner driver will be able to reach kid safe and fun speeds of 3.5 to 7 mph. Start them driving younger than ever! The car includes a powerful 24 volt rechargeable battery along with the charger, so the car ride just keeps on going. This realistic kids ride on features individual bucket seats, power brakes, a working rear suspension, a Smart Pedal variable speed accelerator along with an FM radio and MP3 output (two AA batteries required for radio, not included). The car has two seats, perfect for siblings or for your little one to have a friend come join them in their sweet ride. The built-in car accessories such as the shoulder harnesses, windshield roll bar and cup holders complete the peg perego ride on's life-like look and add an extra dose of comfort for the car ride. Time to get on vrooming! Availability:The Battery Operated Polaris Ride On takes approximately 2 business days to leave the warehouse plus transit time. Please Note: This Item ships ground ONLY and does not ship express or to Alaska, Hawaii, PO Boxes or APO addresses.